Can you imagine this beautiful Salami-Provolone Stuffed Pork Loin Recipe for the holidays? It’s a show stopping main course that’s full with delicious flavors. After having a fabulous turkey for Thanksgiving, I always welcome a main course like this Salami-Provolone Stuffed Pork Loin recipe for the holidays. I had the pleasure of meeting the lovely and talented Sara Moulton at Melissa’s Produce last week. I was so happy to get a copy of Sara’s newest book, Home Cooking 101: How to Make Everything Taste Better, and to watch her do an awesome cooking demonstration. I have been a Sara Moulton fan for a long time. I remember loving her show, Cooking Live, which she hosted from 1997 to 2002. 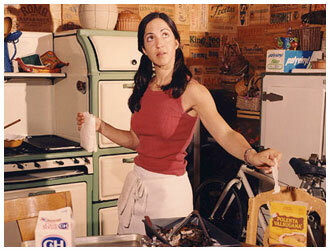 Sara would cook her recipes while taking questions from callers during the live show. If you ask me, she was way ahead of her time. Think about Facebook live cooking demos where people are commenting and asking questions — Sara was figuring this out 20 years ago. Sara is one of the most accomplished people in the food industry — In an article in the New York Times, she was described as “One of the nation’s most enduring recipe writers and cooking teachers . . . and a dean of food television and magazines.” You can find out all about Sara’s numerous, great achievements here. Sara says that for decades her mission has remained the same — “to help the home cook get a tasty dinner on the table every night.” Don’t you love that!? Learn to use all of your senses to help you cook. Do away with Mise en Place! In other words, you do not have to have everything in place and measured out before you cook. (Phew!) Just make sure you have all of the ingredients! Sara Moulton is simply a delight — from her easy, delicious recipes to her fun personality! I highly recommend Sara’s, Home Cooking 101: How to Make Everything Taste Better. This is a book you’ll turn to again and again. It’s “not just a collection of wonderful recipes, it’s also a teaching manual aimed at the home cook. Each recipe specifically demonstrates a tip or method that can make you a better and more confident cook.” You can get your copy here. My Salami-Provolone Stuffed Pork Loin recipe is a slight variation on Sara’s recipe (pg. 258). I added spinach and roasted peppers, and changed the marinade based on the ingredients I had on hand. I immediately thought of Salami-Provolone Stuffed Pork Loin recipe for the holidays. The colorful ingredients make it fun and festive. Here’s a photographic preview of the recipe, which is just below. The result looks fancy and beautiful, though the process is quite easy . . . Roll and tie the stuffed pork loin. There are many stuffed pork loin recipes out there, and this one with salami and provolone is my favorite. For the holidays, or on any other occasion. Can you imagine this beautiful Salami-Provolone Stuffed Pork Loin Recipe for the holidays? It's a show stopping main course that's full with delicious flavors. *The active prep time is 30 minutes, the marinating time is overnight, and cooking time is about 35 minutes. In a small bowl, combine the garlic, oregano, thyme, salt, pepper and olive oil. Set aside. If your pork loin came tied, remove the twine. Then on a clean, dry surface, use a boning knife to trim the pork of some of the excess fat -- Sara recommends leaving about 1/4-inch, if possible. Next, use a Chef's knife to butterfly the pork loin in a roll cut. Here's a video where Sara shows you exactly how to do this! Sprinkle the butterflied pork very lightly with water, and then place a piece of plastic wrap on top. Use a smooth meat pounder or the bottom of your smallest sauté pan to pound the pork until it's 1/2 to 1-inch thick. Mix the marinade and pour about half of it in the bottom of a 9 X 13-inch baking dish. Place the butterflied, pounded pork on top, and then drizzle the rest of the marinade over it. Use your hands to rub the marinade into the pork, being sure it's completely coated on both sides. Cover with plastic wrap and place in the refrigerator overnight. Preheat the oven to 450 degrees F and remove the pork from the fridge. Now, starting with the end closest to you, roll up the pork, as tightly as possible. With the seam side down, use butcher's twine to tie the pork. Here's a video that shows you exactly how to do this! Return the now stuffed pork to the baking dish and place it in the 450 degree F oven and roast for 15 minutes. Then reduce the heat to 325 degrees F, and roast until the internal temperature is 140 degrees F, about 20 minutes. Remove from the oven and let it rest, covered loosely with foil, for at least 25 minutes, before slicing. You can of course buy jarred, roasted peppers if you'd like. To do it yourself, here's how. Wow! This look absolutely amazing. I love the flavor combo on this dish. Yum!! Your pictures are beautiful and I love the step-by-step directions. This looks like a delicious meal!! Love the sound of this, such fab flavours to go along side pork. Thanks, Brian! Hope you try it! Wow–this is incredible! An entree worthy of a spectacular holiday meal, that’s for sure! Wow! Salami stuffed pork loin sounds more than amazing! Sounds like a delicious book I’d love too! Thanks! I hope you give it a try and check out the book! 🙂 Happy Holidays! Looks very similar to stuffed chicken breasts I have made for events that I have catered. Thanks for giving me an idea of stuffing a pork roast. Looks delicious! Hope you will both love it, Jill. Thank you & Happy Holidays! I’m just amazing at everything you have wrapped up in that pork loin! It looks absolutely delicious! I’m a big fan of salami and cheese, and this sounds like something that I would like to try! I am so (happily) jealous that you got to meet Sara! I have been a fan of hers for a long time! (And I am not one to join fan clubs!) Your pork loin looks amazing- like a muffuletta without the bread! So happy to have discovered your blog and your stuffed pork loin recipe. I have friends how absolutely love anything with salami…I’ll be serving this to them soon.